Meet Sushmita Burman : 40-Year-Old Who Is Going On 16! Meet Susmita Burman : 40-Year-Old Who Is Going On 16! Stay At Home Mum Depression Is Real, And Women Are Finally Talking About it...turning around their lives for good. And today's story is how about rising and shining like the Phoenix. Doesn't it shake you up a bit? Or more? Come January 2019. Susmita Burman rose like a Phoenix to emerge among the TOP 10 SHEROES, 2018!! Clearly, Susmita seems to have turned around her life for good. Thus, I decided to explore more about her so that we take inspiration, motivation from her life-journey and stay strong. Isn't it? "Mahima I was an only child due to certain medical complications my mother faced while she was carrying the second baby. And thus, obviously, a very protected child who was given the horizon, the sky to expand her wings and fly. I was 24 and blissful in my job, when a marriage alliance came my way. And I will admit that I was tempted by the idea married to a defense personnel. It is a matter of pride, but then I had just stepped into my first job! " Susmita recalls as she slowly begins opening up. "My parents had left the final decision to me Mahima. But I could sense their willingness that I say yes. My father was nearing retirement and it was the perfect timing in terms of settling financial responsibilities related to me. More than anything Partha (my husband) & I wanted to be life partners. I will restart my career, very soon...and took the plunge in December 2001." The small-town lady from Jharkhand reveals that her life was very different from what she had lived at her maternal house. "I had to make bitter compromises. Though my husband was a silent supporter of me through life, but I could never restart work. In 2003 the birth of my daughter slightly made things happier," recalls a fond mother who says she will give her daughter the biggest wingspan and the highest skies to scale, if that's the latter's wish! Despite being a Commerce graduate, a trained in Computerised Financial Accounting, a PG in Applied Computer Science from TCS..Susmita says she lost herself since she was not allowed by her parents-in-law to step out to work. "I was told we are pretty well to do. I wish I had discussed my career plan with her before the wedding," regrets Susmita adding, " Life teaches you a lot. And my daughter and husband were the only joy in life." She recalls how her father-in-law passed away; how she became the care-giver to her mom-in-law as well as her daughter; but also how she had not lost all hopes to restart a career. She was rather determined, "Time had changed my equation with my mother-in-law towards a better life, and I knew it was perhaps my chance to rise and shine." Recalls a jubilant Susmita, "It was 2007 & I was desperate. 6 years of marriage and 4 years of motherhood just didn’t allow me to live my career plans. I badly wanted to set an example and told myself, “Enough is enough! Time to act”. And I sprung at the first opportunity that came my way in the form if initially being a substitute teacher at my daughter's playschool. I joined my daughter’s preschool full-time later the same year. Finally, I was seeing the end of the road!" But then destiny had other plans and in her second breath, she details. In May 2008, she had her first PSVT attack - her heart had developed a faulty electrical circuit which manipulates the normal heartbeat. She recalls, "Lying on the ICU bed, I was asking myself a million questions. My daughter’s cherubic face flashed before me. This condition went on till 2013. And to add woes to it, in 2010 an auto-immune condition triggered reactive arthritis. While I was just trying to settle with these two life-changing ailments, that Mumbai called us. My husband had turned an HR entrepreneurial partner. And Mumbai was our final destination then. So it was like a complete overhaul in life. Seven years of grooming the tiny tots in school and suddenly again I was being asked by life to restart!" Susmita went on venting out her emotions in one single breath. She accepts how her daughter and husband picked up the new surroundings and new lifestyle too well and too fast. But also how she had lost herself. sinking deeper and deeper into depression, something dawned on her one evening, "In 2014, one evening I told my husband. 'I need help. Come with me to the clinical psychiatrist tomorrow morning.' This decision of mine was the life changer." And Susmita's tone suddenly went high and assertive," Ladies! High functioning depression goes unnoticed but wrecks you inside. Be vocal about your feelings. Have self-empathy, self-care and refrain from regretting the rest of your lives. She told me how she now works from home as a content developer for a Bangalore based firm. As part of their learning services team, her work has been mostly related to e-learning and developing app based skill-sets (English grammar & Maths; grades 1 to 5) for school children, spoken English modules for young adults from tier II & III schools and colleges. Plus, she is also working as a freelance as a content writer with writing & editing firms. And she credits SHEROES for the same, "SHEROES popped up during an internet search in 2014. I registered with SHEROES and created my profile. I was looking for a work-from-home job and I learnt about Sairee Chahal and her venture. Those times SHEROES was called FLEXIMOMS. Then four years later, last year, I downloaded the SHEROES App to explore it. Since then I will say it has been a great journey. My biggest takeaway from SHEROES has been community love. How impact full and strong community relations can be, women supporting women, women empowering women. 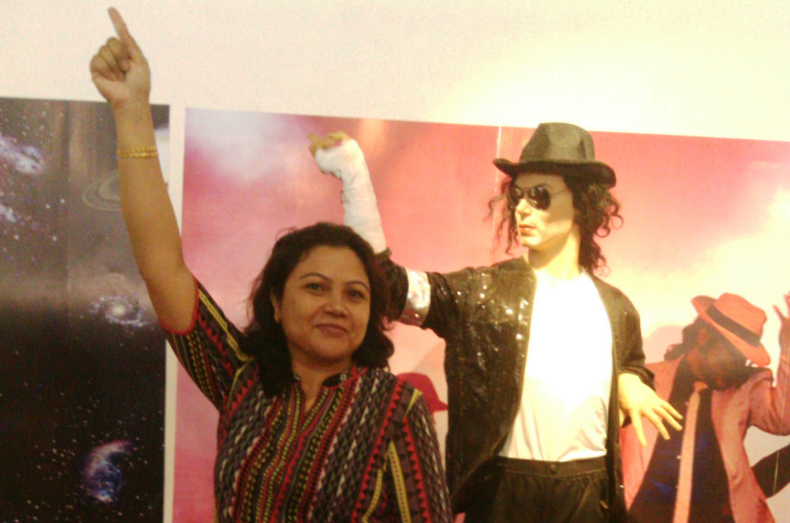 We uplift and enrich each other’s lives," Susmita went all praise about SHEROES. And she has a certain joy in her voice when she details more, which obviously comes from chasing her passion now. " Last year, Merril Diniz from SHEROES put me to write/edit stories on behalf of SHEROES blog in Youth Ki Awaaz (YKA). A big opportunity! SHEROES, Merril gave me a chance to publish it in my name. I was on top of the moon! chuckles Susmita Burman like her a teenage girl. Clearly, life has come back to her once lifeless soul. And SHEROES must be really proud of this! And it reflects through this bold article she recently penned for YKA. So now who is Susmita Burman at heart, now that she has found her lost self? And how would she like to motivate the world? "Well Mahima, I am a simple fun-loving woman who loves to travel, swim and cook with and for my daughter. I enjoy karaoke singing and I can burn the dance floor. I’ve anchored few cultural events and conducted Tambolas," she laughs adding : I am a stuttering lamp…a colourful kite in the blue sky…like a fledgling that takes to flight. "I wish to pull myself away from a thorny life; breakaway from all barriers because my heart wants to chase a passionate life...because today I wish to live for ME!" "I think as women we tend to neglect our inner well-being. In the roller-coaster ride of life I’ve ignored my inner self and while I did what my heart told me, I coped with stress management. So you too fill the gaps, don't be shy to seek help. Love yourself before you can love others." If #HerStory has motivated you, don't forget to pour love in the comments column and do share it among your circle as we all need motivation in life. You can follow Susmita on SHEROES. Yes Neha there comes a point in life when you want to turn around despite all the odds, support or no support. I hope you meet your dreams. Priyanka have you spoken about your difficulties with your husband. Do you have any support around you like parents, friends or any relations? Try using the support available. I understand it's a very tough situation, but please stay strong & positive. Give yourself some time, think before you act & never lose hope. Sushmita.mam. . .it's inspiring..... U r a fighter .....a ....lots of lessons I learnd from ur story...thx fr sharing ur story. to enlightening other's lyf. Hi Meenakshi Prasad...my life's story is very relatable. I am happy to know that you have broken barriers to be one with yourself. I hope your husband is supportive of you & your aspirations. I also hope you enjoy your new work. I started working from home from last 4 years. You can check online. You can join Sheroes MARS Work From Home Community for more news. Susmita Barman@ your story is same like me. As if you are writing my story. Even I am going through same phase. But I have overcome; as I had a discussion with them. Let me live my life or I will quit this married life. And aspire my dreams and take care of my daughter. So now they don't interfere. I too don't disturb them . I have planned to join as a pre nursery teacher from March with my baby who us turning two. I will start from scratch , because it's almost 4 years break post marriage. And she z too active and happy baby.she wants to play with kids. And I will be with her. I have my parents in same town. So my energy level is higher always. But in future I will surely try to brush up the moods and boost and motivate other girls too. Loved your story.Just let me know how you started with home based job. Sathyavati your comment made my day! Thanks for your kind words. Much love. Glad you found it inspirational Uma. Hi Rupa Kapadia...my story is more or less every woman's story. Please try to shake the barriers around you. I knew I couldn't instantly break them, so I started trying & this itself took me 6+ years. If you feel so low about yourself, how will you achieve? Think that you can...think there's still time...keep dreaming. Please take motivation from whatever is around you. Just keep the fire within you burning. Bad phases don't last forever. Hi Jaya Jotwani...try not to lose hope. Hugging you & passing you the positivity. Will wait to hear from you. Take care. Hi Tanu...ki khobor? The moment we stop being or feeling positive all roads shut before us. The more positive you are, new avenues keep opening before you. Your journey becomes good to better. Shalini I feel glad because you found my lifes's story inspiring. It's important to awaken our inner selves & live a better quality life. Nandita I've hugged you...know this. Love to you too. You know what.. I need to bow down to you 🙏🙏🙏. You are an inspiration.. Loads love to you.. Depression is something that is not addressed..
Oh! Yes! Jalpan Lala it's always been my effort to impact ladies around me in the positive way. We inspire & learn from each other dear Geeta Upase. Stay well. Lots of love and hugs to you too Pujashree. Anita T I am touched that you call me bahen. Hugs. We are all like sunshine, radiating positivity around. God bless you too dear. Love you Versha Gupta. Zindadili Zindabad!! Kavitha & CK Kalpana...you won't believe how much I wanted to get well & at the same time be an example to all the women in my life, especially to my daughter now. That's why I say we are all the same, just different stories & struggles. What is important is to never give up. Glad that we connect on this. Thank you Megha & Akansha. Susmita, your spark has always shone through... You are a true Shero and you have faced your battles well. Keep shining, dear! Truly an inspiration..All the best for your endeavours. Hey! Kavya Shree one life yaar...what to do? Just had to do it. Living life is so much fun. Love to you. Many of us experienced with this. But you are inspiration for all of us. Lizy SN more power to you too. Hugs dear Uma & Raina. Woo.....The reading experience itself, makes me blink.....how much battles has been won by you. Much to learn, from the story. More power to you Sus sis and thanks again Mahimaji for this wonderful narration. Thanks Preeti. I didn't want to stop, no matter how bad things were. Love you darlings - Pinky & Nigar. I was waiting for this article Mahima Mam, this lady truly is inspiring...Sush....salute to you lady !!!!!! You have been an inspiring figure for all of us Susmita...love you! !